At work, we have some problems with content. Like many organizations, we cannot create enough of it. The business is very profitable, but very lean. That means the subject matter experts in the company are too busy to help create content. So, we struggle to update everything from collateral to the web page to the social media and blogging. But that's not the problem I'm thinking of now. And to be honest, it's not a "content problem" per se. It's a marketing problem. And content is the answer. Content Marketing, that is. You see, our approach to marketing is a bit out of date. Sure, we use all the latest tools--social media, webinars, videos. But it's done in a very "old school" way. One-way, broadcast, pitching of company and product: "We are Great!" "We're the Experts!" "We're the Leaders!" I'm making the case for Content Marketing. I believe we need to use a publishing model to create content that fits a "Content Funnel." That is, first decide on the conversations we want to have and profile the audience for each conversation. 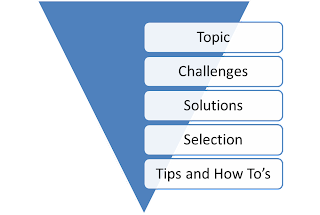 Produce content in layers, starting with topic overviews that are completly void of brand pitches. When a user responds to one of these--watches a video or downloads a white paper--we know they are at least interested in the topic. They may not be a buyer or an influencer. But we can find out by linking one layer to the next. That link is in the assets themselves. And in the campaign we drop users into. The next layer is content that discusses the problems and challenges in the domain (in our case, data networking). As the top layer links to this layer, those that take the leap are that much more qualified. Next, we introduce solution options for the challenges; here we can start our positioning. "Below" that, we produce content to address the solution selection process. This is where we can finally talk about our solutions--or at least frame the conversation to favor our offerings. Finaly, at the lowest layer we have tips and techniques--here we are fully showcasing our features and strengths. These impart credibility to prospects and validation to existing customers. As readers move through the layers, they self-qualify. Many will fall out. Tha'ts okay, we can put them in campaigns to nurture them. But the Funnel is only one dimension. The content also has to be good. This is where the concept of magnet content comes in. The content has to be good. That means it is: unique, useful, interesting, tuned to the channel, and fun. Yes fun. Fun is relative. Maybe "engaging" is a better term. The point is, people have to want to sit through it! Next is the infrastructure. Can you deliver the conent? Track performance? Score the leads? Route them when qualified? Follow up on conversion to sales? The last step may be the hardest. Most of it can be done through technology alone. But once a lead is passed to sales, all bets are off. You have to make sure they work the lead and record what they do to properly account for success and failure. Some of you have been there before. Others are at the start like me. Please share your comment on what works and what doesn't. I'm particularly interested in the change management part. How do you get the marketing organization to change to this "publisher" mindset? How do you get even broader buy-in to support the content creation and sales engagement? And how do we build the case to support the funding and organization changes needed to get started? Share your learning with all of us!